Kellogg's has developed a hi-tech method to stamp out imitation cereals - by branding Corn Flakes with the company logo. The new technology enables the firm - which makes 67 million boxes of Corn Flakes every year - to burn the famous signature onto individual flakes using lasers. Kellogg's plan to produce a number of one-off trial batches of the branded flakes to test the system. Bosses will then consider inserting a proportion of branded flakes into each box to guarantee the cereal's origins and protect against imitation products. If the system is successful it could be used on Kellogg's other best-loved brands including Frosties, Special K, Crunchy Nut and Bran Flakes. The laser uses a concentrated beam of light which focuses the energy within the beam, down to a very small spot on the Corn Flake. The energy density within the laser spot diameter is sufficient enough to give the surface of the flake a darker, toasted appearance without changing the taste. Kellogg's embarked on the project to reinforce that they don't make cereals for any other companies and to fire a shot across the bows of makers of 'fake flakes'. Yesterday Helen Lyons, lead food technologist at the company, said: ''In recent years there has been an increase in the number of own brands trying to capitalise on the popularity of Kellogg's corn flakes. ''We want shoppers to be under absolutely no illusion that Kellogg's does not make cereal for anyone else. ''We're constantly looking at new ways to reaffirm this and giving our golden flakes of corn an official stamp of approval could be the answer. The company also released figures which show sales of Kellogg's Corn Flakes have risen in 2009 as shoppers with limited budgets opt for recognised, reliable brands. 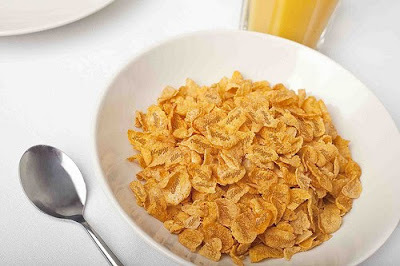 A staggering 128 billion bowls of Kellogg's Corn Flakes are eaten worldwide every year in countries as far afield as Guatemala, Japan, Argentina and India. And an incredible 2.8 million bowls of Kellogg's Corn Flakes are eaten in the UK everyday - that's one billion a year. The firm's Manchester factory is also the biggest Corn Flake production line in the world and churns out cereals 24 hours a day, 365 days a year. This is interesting to me as a marketing student as I was recently discussing the effects and ethics surrounding supermarkets ‘copying’ known brands packaging and whether this was an intentional act to ‘con consumers’. Earlier this year it was reported that one in three shoppers admitted accidently buying the wrong product (a supermarket’s own brand) because it’s packaging was similar to that of a well-known brand, a study by the British Brands Group found. The survey found that some 65% of shoppers said similar packaging can be confusing or misleading and some of the named offender’s where Asda’s, ‘You’d Butter Believe It’ which was alarmingly similar to Unilever’s ‘I Can’t Believe It’s Not Butter’ and Lidl’s ‘Jammy Rings’ resembling the more well known Jammy Dodgers. I can understand then why Kellogg’s are worried and see this as a huge threat to their products but that aside – is this scheme really going to come to fruition? I doubt it; in my opinion it seems to be a news grabbing PR stunt. Firstly, I am a little cynical about the stage this new food technology is at (the photo released is digitally manipulated, not using the new technology) and a few online news sites have expressed their difficulty in getting a clear answer from Kellogg’s about the likelihood they will adopt this scheme. The above mentioned Helen Lyons, the food technologist is conveniently on holiday so not available for comment. Even if this was imminent, is it really a good use of money? I would assume it is very costly and time-consuming so would these resources maybe be put to better use elsewhere in the business? After all, Kellogg’s said one of the main reasons for considering this technology was “to reinforce that they don't make cereals for any other companies”, great – so surely the Kellogg’s logo on the box is enough for me to know I am eating their cornflakes?